And colleagues who are going to buy their own WOLF in the future, or are so far only enthusiastic about this specific model of Mercedes. 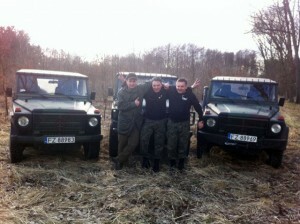 Everyone can join, but with a Mercedes G-class military, regardless of year of manufacture or origin of the car. However, among the permanent members only those can join who bought his WOLF from us, and was recommended by at least one of the founders of GF1. At the moment we do not act as an official association, but thru our enormous enthusiasm for the military “Gelenda” we organize various trips and meetings to exchange our experiences related to the operation of our vehicles and equipment. Of course, the short version of the Wolf with engine 250GD plays a prominent role, which is purchased by our company Wallrave Sp. z o. o. Zweigniederlassung Germany from the German Bundeswehr and offered to Polish customers. GF1 Activity is purely hobby and we organize various types’ of trips in interesting and unreachable places. Because of the diverse academic and professional work, both permanent members and our friends have a rich technical background and relevant knowledge that is indispensable in modern times when buying sport utility vehicle with a military pedigree. We are available to anyone who is interested in a Mercedes G in the military version and have questions or problems related to the acquisition, documentation, operation, additional equipment and state of origin and Wolf condition. On the pages of our site we will post over time, much valuable information on the military version of the so called. „Gelenda. 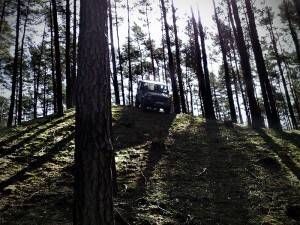 We also invite you to visit www.gelenda.pl that treats about Mercedes G-class; the site is undoubtedly one of the best of its kind in Poland.